No doubt, in the present era of online publishing, it is the content writing, that plays a very important role in getting a product and services get promoted. Online content writing, whether used to promote online business or providing information on a very relevant issue and topic of social awareness, has great relevance in online media. The other important aspect of online media that is more or less co-related to search engines and the method to promote content on search engines is known as Search Engine Optimization (SEO). SEO invariably now is playing great role in online searches when more and more people are coming to search engines to obtain information about a product or service. 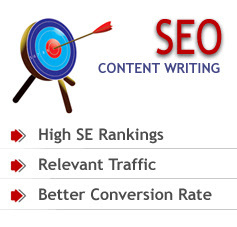 Hence, content writing mixed up with principles of SEO brings great results on SERP (Search Engine Ranking Pages) and internet marketing. To bringing SEO in content writing one can begin from relevant keywords in titles, meta tags and the most importantly on web pages where keywords appear. After title, opening paragraph or introductory lines should have themed keywords into it. Subheadings are the next important segment of the page that requires proper placement of the keywords to bring proper content writing impact regarding SEO impact. Finally, the conclusive content of the page must be there with themed keywords into it.